July 22, 23 & 24, 2009 - Wednesday, Thursday and Friday are for trail runs. Please plan to be in Ouray by Tuesday evening so you can join everyone else on trail rides beginning Wednesday. NOTE 1: There is at least one requirement we make for those who join us for the trail rides. You must have a low range transfer case on your vehicle. NOTE 2: This gathering of FSJs is not endorsed or sponsored by any web site or forum managed or owned by CFSJA.ORG or IFSJA.ORG. There are no dues or fees involved. Ouray FSJ Invasions are for free and for fun for anyone who owns a Full Size Jeep or have one in the family. 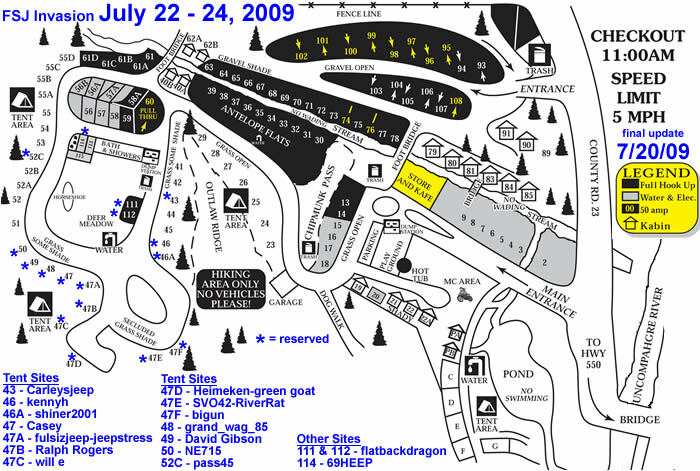 For 2009, we invade the San Juan Mountains with our FSJs all over again! Please plan to be in Ouray by Tuesday evening (July 21). We will be trail riding Wednesday, Thursday and Friday. There is the option stay another day and get together for a ride on Saturday as well. The socially acceptable FSJ place to camp is at the Ouray KOA. We have sites 45 through 52 on hold for you to reserve until the end of December. 47D is the social gathering place for camp fire meetings. That site is reserved by Krista and I. Anyone who wants 47D can contact me and I will help you get it. Since we are not sure how long everyone might be able to stay, be sure and let KOA know which day you plan to depart. It is pretty laid back in the back by the aspens and only a short walk to the bathroom and showers. You are responsible to get and pay for your sites if you stay at the KOA or anywhere else. If you stay at the Ouray KOA, you are expected to comply with the KOA park rules while there. The best bet is to determine if you can make it to the 2009 Ouray FSJ Invasion and reserve early. Please remember: if you cancel less than 48 hours before your arrival date, you pay Dave for at least two nights. Your bill with KOA is your responsibility. Here is the KOA web site: OURAY KOA We recommend you reserve your KOA site by contacting Dave by email or call 1-800-KOA-8026 and ask for Dave. The office is open 8AM to 10PM until Labor Day. When you contact the KOA, tell them you are with the Full Size Jeep Group (not FSJ group). Dave and Deborah spend the winter in Florida and will be leaving Ouray by the end of October until next Spring. They can take your reservations from where ever they are, but it may take a couple to a few days to make your connection once he has left for Florida. Please be patient with making reservations. Here is a link to other Ouray lodging options. Note: Discounts mentioned in the link above only applied to the 2002 Ouray FSJ Invasion. Please PM me when you make your reservation with KOA and I will update the map. Last edited by fulsizjeep : 01-15-2009 at 10:07 AM. Ok I am definately making 2009! I'm planning now! x2 already told work im taking off!! Last edited by bigun : 07-26-2008 at 05:55 PM. I just signed up for sight 56! Already looking forward to it. I am not happy I missed this year and am looking forward to next! Just signed up. 7/27/08 3:00pm. Will be on lot 57 next to will e.
Any chance of getting a peek at the 2010 dates? It's really not my place to say this, since A: The 2010 dates do not exist, and B: It's not my call at all. I will provide a bit of insight as to the dates, but I make no claim as to being accurate (I'm sure the original CFSJA membership knows this by heart). 2002, took place in August. I'm old, it's been a bit, I do not remember the exact dates. When 2003 came into play, Don, myself and many others discussed moving back into July to accommodate students and teachers. Since then, it's sort of been in that 3rd to 4th week of July. Forgive me if my memory has prolapsed, but I think that's pretty close. True statement. There was talk about moving it back to the 4th week next year to avoid the FJ'ers, and it looks like that's what Flint did when he posted the 22nd-24th. I'm for either week, plenty of time to plan for it. The news came last week; Kathy got orders to the Reserve Center in Denver so we're staying. Wahoo!!! This year wasn't my last Invasion! Planning for next year already...maybe more family this time! I personally think the prime time to be in Ouray is the last week of August and first week in September but that is not good timing for a lot of people. The flowers are pretty well spent by then but the passes and basins are open and monsoons are usually done by then. I like the flowers and the monsoons. I remember last year taking shelter and cooking sausages and cheese crisps (with los dos salsa) while waiting out the rain. It was awesome. Remember, us desert rats don't see a lot of rain. I just reserved 47B for the whole week. Yeah - but us mountain rats know that you can get washed off'n the mountain when it rains. I reckon that's why we don't see too many desert rats up here. They done got washed off the first time it rained. "Dude, wow, man.... look at the rain!.... hey, what's that sound like a soggy rocky locomotive hurtling towards us??" "AAAAAAHHHHHHHHHHHHHHHHHHHHHHHHHHHHhhhhhh!!" I hope you see alot more Desert Rats this coming year, Little Lady. I sure hope so! I do so like you Desert Rats ever so much! ok so im trying to reserve site #50 and emailed dave and he said that i should go to the koa site. so i did that, i cant pick the july 2009 dates. so what am i missing?? how are you guys doing it?? Personally, I think the FJ folk were pretty nice people for the most part. I talked with a few, most were, well, just folks like us. Probably no more or less mature than the FSJ group overall. Both groups have their good/bad sides. If this needs to be moved into late August, that's fine. There could easily be two FSJ groups there at two different times. No rules to follow, I doubt it would be a point of contention.